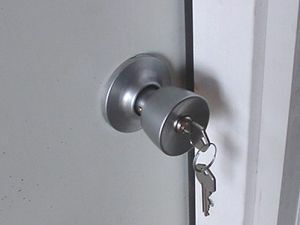 Installing a lockset on a new door is requires a minimal amount of skill and tools, especially if the door is pre-drilled. If you order a custom door, it's best to have the manufacturer pre-drill the door. In this article we show you the steps involved to the lockset installation. Use a sharp chisel removing a small amount of wood at a time. Check the latch positioning as the manufacturers are not always accurate. Slide the latch assembly into the door and mark around the edge. The manufacturers typically machine route for this, but the corners are rounded. Also, the depth is often too shallow. Using a sharp 1-inch chisel and clear away excess wood. Adjust the latch assembly. This unit adjust for 60 or 70 mm distances between the center of the door handle and the edge of the door. Slide the handle (section with protruding catch parts) into the door, aligning the internal parts to engage. Place cover plate and align the holes. Install the screws, but do not tighten completely.